Giant UFO Mothership Or Peculiar Cloud? Is it an alien invasion? Is a giant UFO mothership? Or is it the end of the world? These are the questions that come to mind when you see the ominous cloud formation seen in the sky after a storm near Memphis, Tennessee. The odd formation prompted at least one person to snap photos and ask what the UFO-like sighting could be. The unnerving photos were snapped by Colby Hutton in the sky over Adamsville, Tennessee as he was driving over a bridge, according to Hutton's mother, Angie Hutton. Mrs. Hutton shared her son's photo on Facebook hoping for some answers as to what exactly she and her son witnessed. Members of the WMC Action News crew asked, "Is that a cloud or a UFO?" 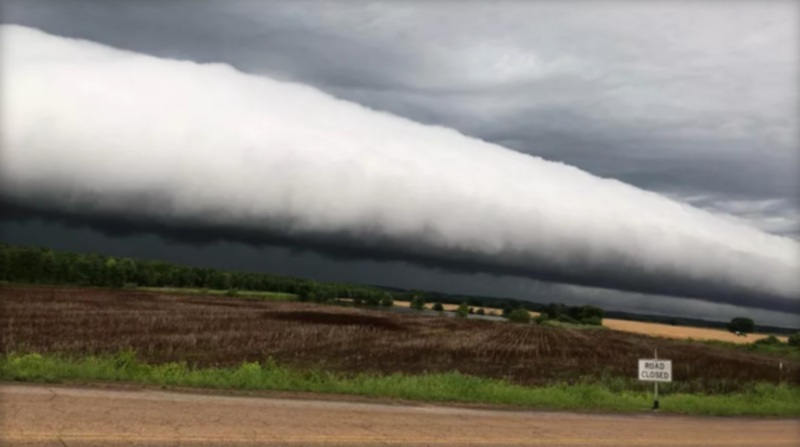 The news station's weather team identified the massive object in the sky as a "roll cloud" which is a rare form of an arcus cloud. According to WMC Action News, there are two types of arcus clouds: roll clouds and shelf clouds. The WMC staff explained, "Shelf clouds are usually found along the leading edge of a super-cell thunderstorm. Roll clouds can sometimes form in advance of the shelf cloud when a horizontal vortex forms. It can then become detached from the structure as the storm decays and continue moving along appearing to be rolling horizontally across the sky." The oddly shaped Roll clouds are completely detached from the thunderstorm base or any other clouds and appear to be "rolling on a horizontal axis which is how they earned their name. NASA commented on the sighting and said, "These rare long clouds may form near advancing cold fronts. In particular, a downdraft from an advancing storm front can cause moist warm air to rise, cool below its dew point, and so form a cloud." Even though the eerie cloud formation resembles a massive side-ways funnel, NASA was adamant that roll clouds are not thought to be capable of morphing into a tornado. Roll clouds are so rare that most will go through their entire lives without ever seeing one in person. Perhaps that is why the sighting is so mysterious and so little is known by the general public about them. We saw a sea serpent in San Francisco Bay on February 5, 1985.